a lone reservoir broke the brown, rocky hillsides. The road twisted around ever vaster slopes as we left Fes behind for the Rif (الريف; pronounced "reef"), the lawless mountain region at the heart of northern Morocco. It's no coincidence that back in the US we call potheads "reefers"—the Rif is ground zero for production of Morocco's most valuable export: a concentrated resin derived from cannabis, and known locally as kif and abroad as hashish. Friends here in Fes who traveled to the Rif in recent weeks returned with reports of wide fields of cannabis growing in the open, and sheds full of dried marijuana. 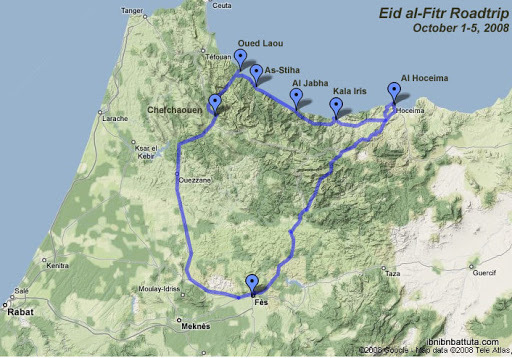 By noon we reached Chefchaouen (شفشاون). 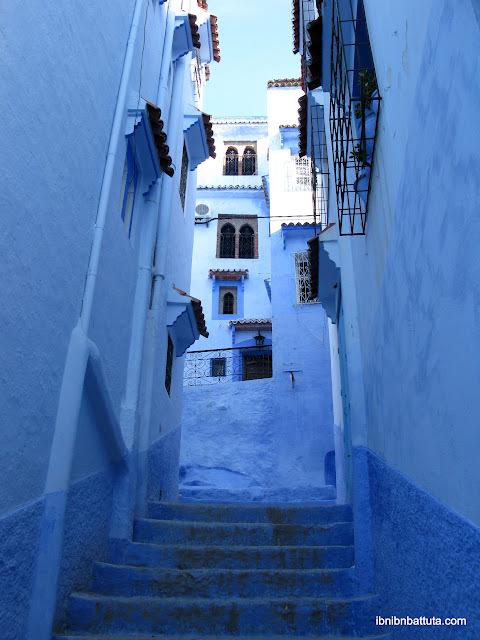 I was expecting a larger, more tastelessly modern city, but was surprised by Chefchaouen's quaint, small-town feel. After pitching our tent at a campground on the hillside above the city, we started exploring. Chefchaouen's medina is still the heart of the town. There, houses and even whole streets are painted in brilliant blue and violet hues. Cobblestone lanes wind between the town's Andalusian mosques and ornate doorways, dappled by the sunlight that leaks through grapevines overhead. The city's blue walls emit an eerie glow, and a glimpse through an open doorway into a home feels like looking into the depths of an igloo. Known for centuries as the base of indigenous resistance to coastal Portuguese and Spanish settlements, Chefchaouen today welcomes European visitors with zeal. The town is a natural crossroads between European backpackers and Moroccan kif, and attracts a certain breed of tourist in abundance. They filled our campground: drugged out, dreadlocked European twenty-somethings, strumming on guitars at all hours from the hazy depths of their RVs or tents. Under pressure from abroad, the Moroccan government finally got around to legally prohibiting marijuana cultivation in 2004, but that move has done little to dent the local trade. During our visit, overly outgoing locals put far more effort into selling us kif than carpets or other standard Moroccan fare. Nonetheless, Jacqueline and I passed a relaxing afternoon snacking, reading, and people-watching at a café in Place Uta al-Hammam, the medina's main square, where local men relaxed in cafés, sipping tea and people-watching right back. Children ran through the square playing with their new holiday toys, and Morocco's ever-present alley cats dodged to and fro in search of fallen table scraps. Late in the afternoon, Jacqueline and I walked up to a ruined mosque with a view over Chefchaouen, and finished our day with fresh goat cheese salads and tender lamb tagine at a lavishly decorated local restaurant. On Thursday morning, we broke camp early and set off with a small day pack for a hike up al-Qala'a (القلعة), the peak that towers over Chefchaouen. The ascent follows a winding gravel road along the steep slope over the city before cutting deeper into the mountains. Along our hike, we passed just two ramshackle homes and a few goatherds tending their flocks.